My favorite ingredient for refining skin imperfections is Kaolin Clay. Not only is it a natural product that helps purge breakouts, it soothes inflammation, redness and tones all skin types. It can be drying so always apply your moisturizer on after removal of a Kaolin based mask. Try it as a spot treatment over a pimple to accelerate the healing process. Covergirl makeup introduced blast flipstick, a dual sided lipstick, with one side creamy bold color on the other side a shimmery shade. Their expert makeup artist, Pat McGrath, created these duos to be blend-able allowing users to make their own custom shades just as makeup artists do. Pictured on my lips is my favorite, stunner. A common woe is the inability to mix darker and lighter hues without getting a muddled look or the dark completely overpowering the creation. These formulas all combine together to create vibrant shades. The ability to blend shades is how we as makeup artists are able to create unique looks. I received several shades for review. Not all of the colors were for me but I am stashing them in my makeup bag and have already used them backstage for a dance show. The color I kept for myself and am LOVING is "stunner". The two tones are bright pink and gold shimmer. Perfection. Gold on its on makes me so washed out. I apply a thin layer of the pink and then swipe a few stokes of the gold over the top for my current go to day time shade. A fantastic shade of poppy can also be blended using a couple layers of the bright pink over the gold from the stunner flipstick and blending well. Poppy is a choice lip shade this spring. Its got the bold factor of red, the sweetness of pink and the touch of orange that give it a look of its own. The blast flipstick is another win for Covergirl. In addition to all the custom looks you can create, the wear alone shades are gorgeous and the formula is more moisturizing then some lip balms on the market. In fact the moisture factor is why I have made stunner my go to shade. Naturally I had to love the shade too but the deciding factor on a lipstick is always how drying and long lasting is. The color stays put without staining my lips or shriveling them up into a chapped mess. I do my DIY lip exfoliating treatment at least once a week in the winter, no lip color looks good and dry lips. Covergirl released flipstick smack dab in the middle of the Ombre craze. See Sofia Vergara looking stunning with a poppy to copper pout done ombre style in the Covergirl ads. Line your lips with the edge of the lipstick using the darker tone. Fill your lips in with the lighter shade of your dual tone and blend in without completely disrupting the lined edge so that you can see the contrast. The look is fun, bold and high fashion. 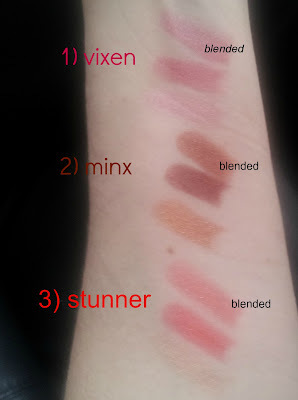 I swatched the three flipsticks I received in both tones plus a swatch of the two tones mixed. I am a bzzagent and received these products free for unconditional review for their campaign. 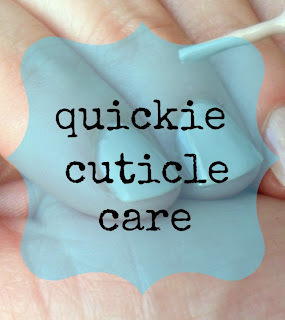 This is a quick step to help keep your cuticles soft and pushed back. Dry, cracking and over grown cuticles can be a problem year round but as the months get colder it gets harder to maintain pretty fingers. When you step out of the shower your hands are softened from the steam. Take this oppurtunity to gently push your cutlicles back when you dry off. All you have to do is use your towel to quickly push them away from growing up the nail. Add your moisturizer generously. 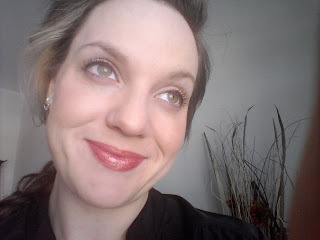 I make the most of my facial cream in this step, read my method here. A common question I get is how to lessen the appearance of wrinkles and fine lines. The quickie makeup fix uses concealer and highlighter. The resulting look softens the lines, especially diminishing their appearance in photos due to the light reflecting pigments found in highlighter. 1. Even your skin tone as you normally would. Always start with a moisturizer. 2. Dab a concealer that is not drying along the lines you are targeting. Dry concealer will settle in the lines making them more obvious so choose wisely. 3. Using a highlighter pencil draw on top of the lines, dab with your finger to soften the edges. Use your pinky finger to apply on top of the lines if your highlighter is not in the pencil form. 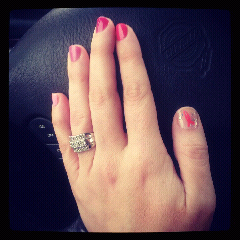 I polished this Mani in a few shades of pink and added the breast cancer ribbon on my thumb. The salon in which I work is all a buzz with fund raisers and promotions in support of Breast Cancer awareness. My mani joined the decor and cause this week, of course my thoughts did as well. Joining The Nail Files this week! For your moisturizer to penetrate beyond the skin's surface and provide softening, supple moisturization don't forget to exfoliate 2-3 times per week. Increased penetration of all your other products. Increased cellular turnover, revealing more youthful and healthy skin. Many exfoliation products are on the market. Choose one that works for your skin type and add it into your regular routine if you are not already doing so. Lots of changes in my world off line have led to changes online. I frequently share tips of my own and some of my favorite finds from across the industry on twitter. Join me there @amariebeauty. If you are looking for my tips and product revelations please come and read my weekly feature, American Beauty, on USALoveList.com. Every Thursday I share some of the latest and greatest product finds paired with some useful information. I am going to bring some new posts on and continue Tip Off Tuesday right here on AmarieBeauty as well. Tip Off Tuesday | Keep Your Skin Plump, Free Anti-Aging! Collagen and Elastin play a large role in keeping our skin's youthful appearance. Collagen gives our skin strength. Collagen fibers bind and attract water to keep the skin hydrated. Elastin gives our skin flexibility, it keeps it bouncing back and looking toned. Aging decreases both collagen and elastin production causing skin to sag and wrinkles to form. Proper skin care is crucial for the preservation of your facial appearance. To keep that production up, stimulate the fibers often by massaging in your creams and giving brief pressure point massage (Shitasu) to the common areas of concern. See the Shiatsu post for more information. This is my favorite free anti-aging tip! How to minimize the appearance of wide set eyes. Apply a darker shade of eye shadow from the inner corner of the eye toward your nose. Blend a lighter shadow from the middle toward the outer corner. Apply mascara with inward strokes. That is the basic makeup correction for wide set eyes. Dark colors have a minimizing effect so using this technique draws the space together. Earrings used to be my must have, do not go without accessory but that changed to bracelets some time ago. 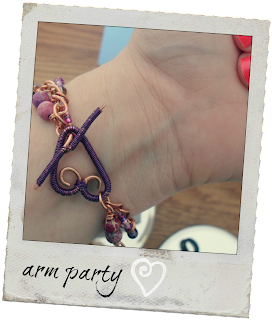 I especially love custom and hand made jewelry so when I heard about the Arm Party I was all over it. I usually just make things on a whim, I dig around in my supplies, searching for things that I find to meet the crazy vision that has randomly popped into my head. This usually steers me way off coarse and leads to under production of things that should happen but to the production of fabulous jewelry. 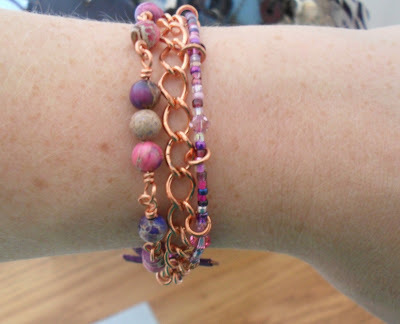 To design my Arm Party bracelet for Janeen my exchange partner I did not veer to far of my usual creative course. 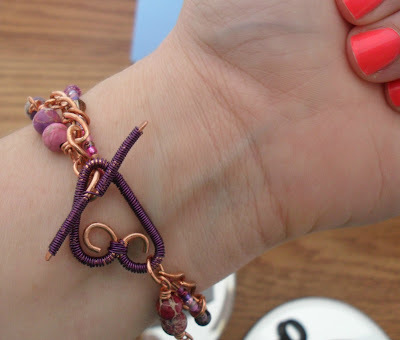 I did check her blog out to troll for ideas and thanks to the Arm Parties handy, dandy, little google doc, I had an email telling me what colors she was in to. I made her two bracelets, one using vintage buttons and the other using tee shirt scraps. 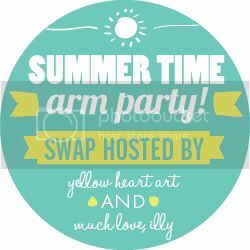 Go check Wild Vanilla Designs to see her reveal of the goods I mailed for the Arm Party. I am a pleased party par taker. I love the look of three in one. The metal is beautiful and does not irritate my skin. The colors are the business! 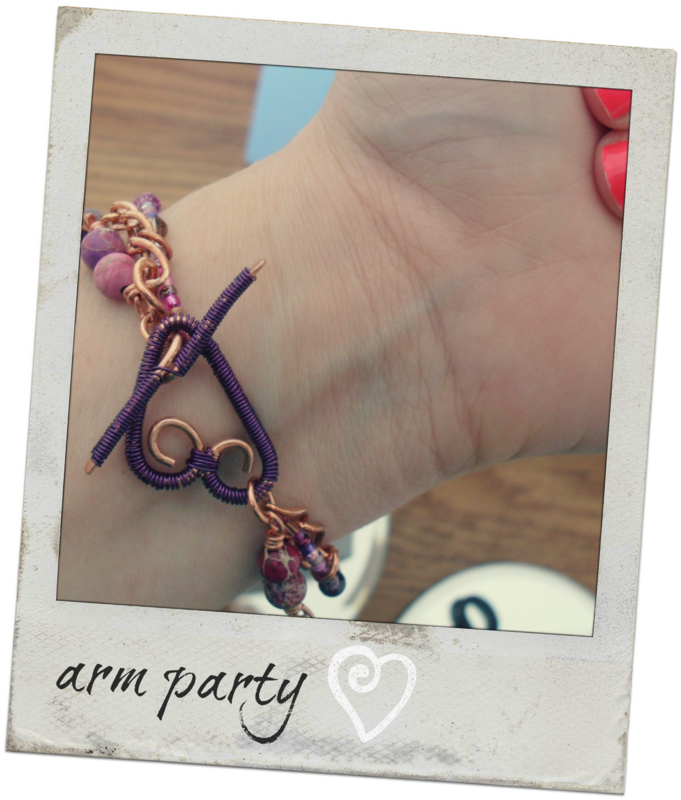 Looking forward to seeing other designs in the Arm Party link up. I will be back later today with my usual Tip Off Tuesday! 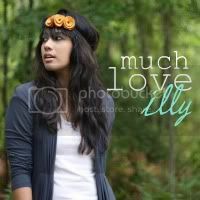 You can find Janeen at here site Wild Vanilla Designs or on twitter @wildvanilla.